This grand adventure is full of humor, heart, and the most beloved characters of all time -- Bambi, the wide-eyed fawn, his playful pal Thumper, the lovable skunk Flower, and wise Friend Owl. 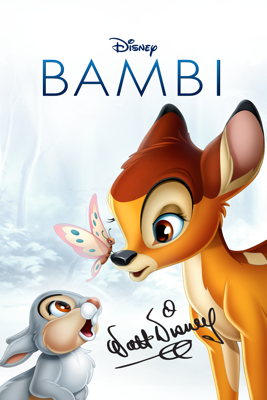 Featuring breathtakingly beautiful artwork and Academy Award- nominated music (1942, Best Scoring Of A Dramatic Or Comedy Picture and Best Song, "Love Is A Song") Bambi's story unfolds from season to season as the young prince of the forest learns valuable lessons about friendship, love, and the miracle of life. Everyone will be "twitterpated" by this endearing classic tale of BAMBI, one of Walt Disney's greatest triumphs and a film experience you'll never forget. © © 1942 Disney Enterprises, Inc.